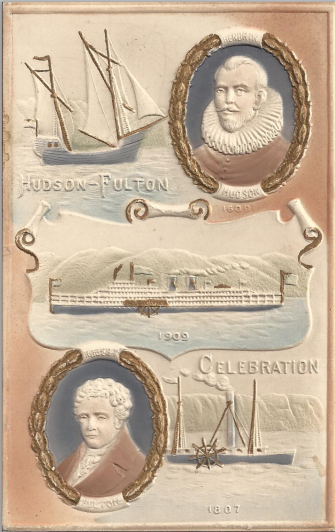 On September 25, 1909, New York launched one of the largest and most ambitious festivals in its history, the enormous Hudson-Fulton Celebration, which commemorated 300 years since Henry Hudson had sailed into New York Harbor, and a century (give or take a couple of years) since Robert Fulton's North River Steamboat had been launched. 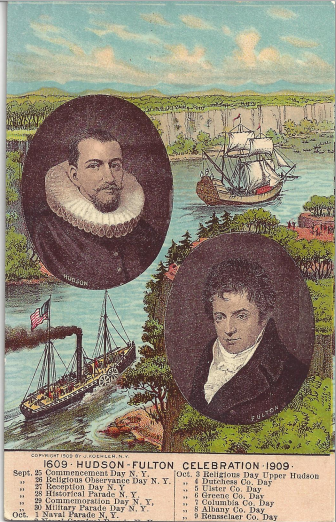 This rare, embossed postcard emphasizes the improvements in navigation over three centuries. Among the many events that took place during the celebration (some of which can be seen in the small type at the bottom of the top postcard) was a naval parade that included everything from replicas of Hudson's ship Half Moon and Fulton's sidewheeler steamer to the RMS Lusitania. As a nod to the direction in which transportation was headed, Wilbur Wright took to the air as well, circling the Statue of Liberty on one day, and flying up the Hudson to Grant's Tomb and back to Governor's Island on another. In 1909, it's safe to say most New Yorkers had never seen an airplane flight before. 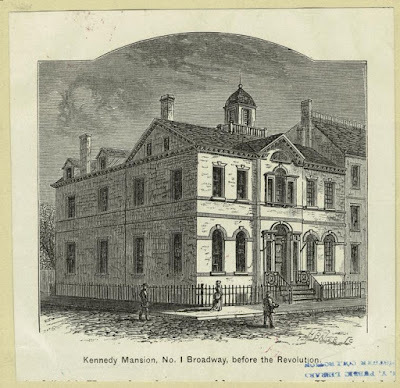 A glance at the book-shelves of any great public library will show how industrious the historians of Massachusetts and Pennsylvania and Virginia have been in recording the annals of which they are justly proud and how comparatively indifferent our own writers have been in this field. And this disparity has resulted in a very general ignorance of the full part played by our Colony and State in our national history. courtesy of Hudson River Valley Heritage. 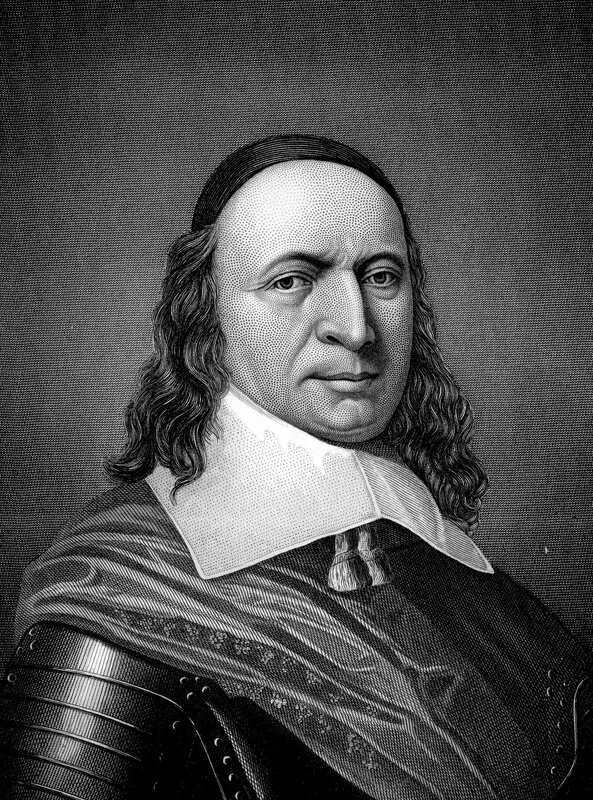 The Historical Parade featured floats from every period of New York's history, from the Native American era to 1909, with a special emphasis on the city's Dutch roots and its role in the American Revolution (as shown in the float above). 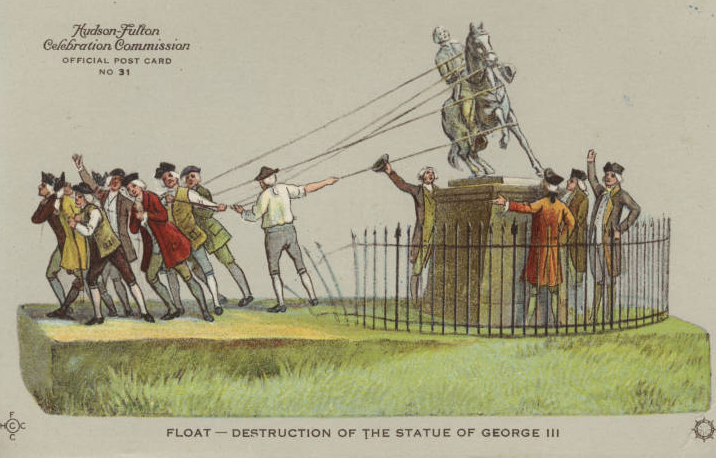 You can see many more postcards of floats from the parade -- along with souvenir programs from 1909 and other ephemera -- at the Hudson River Valley Heritage website dedicated to the celebration. A century later, in 2009, the city once again celebrated the arrival of Henry Hudson (albeit in a somewhat more subdued fashion). One permanent souvenir from that celebration is the Dutch pavilion in Peter Minuit Plaza in the financial district, which we write about in the first chapter of Footprints in New York. 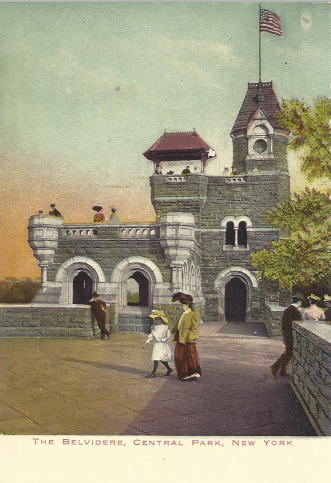 We have a lot of wonderful Central Park shots in our collection, but this may be the best: Belvedere Castle as it looked ca. 1905.
an architectural folly built by Vaux and Mould in 1867. It was designed to do nothing more than provide the optical illusion for viewers at Bethesda Terrace that somewhere deep in the park was a giant castle. It was the pinnacle—excuse the pun—of Olmsted’s picturesque vision for the park. The greatest amounts of the park were to balance the principles of the picturesque—thick woods, painterly contrasts of light and shadow, and the occasional castle—with the pastoral: sweeping vistas, sloping greensward, open meadows, and an actual pasture.... To contrast with these open green spaces, Vaux and Olmsted and their chief gardener, Ignaz Pilat, planted wooded areas such as the Ramble and the North Woods, forty acres in the northwestern corner of the park that were landscaped to mimic an Adirondack forest, complete with ravines, rustic wooden bridges, and a “loch,” all straight out of an Asher Durand painting. Lastly, Olmsted and Vaux realized the importance of also including a formal centerpiece to the park. The Mall, one of the first areas of the park to open to the public, is not just a straight path, it runs exactly north- south and is lined with four rows of American elms. Pedestrians, led due north along the promenade, come to Bethesda Terrace, the artistic jewel of the park. The shock of this overt formality reminds viewers just how informal the rest of the park seems. Similarly, the picturesque touches—a wooden gazebo here, a fake castle there—create views that are almost too much like postcards. And so the mind says: Ah, well if these views are fake, everything else must be real. Today, Belvedere Castle houses equipment for the national weather service. You can read more about an array of Calvert Vaux's architecture around the city in James's piece on Vaux that was published in Curbed a few weeks ago. No postcard today -- we're on the road traveling. 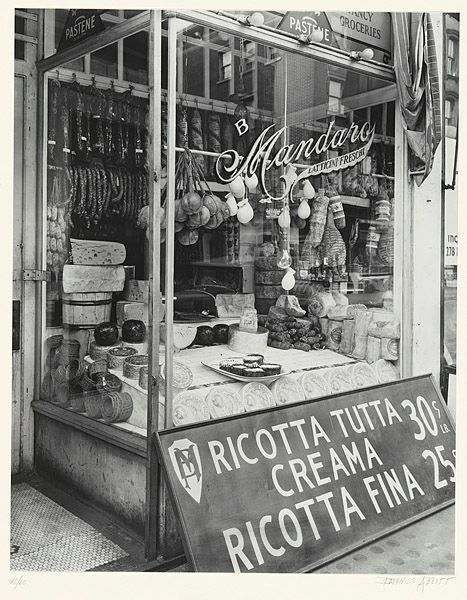 Instead, check out the piece that James had published today on Curbed tracing the history of St. Mark’s Place in the East Village. 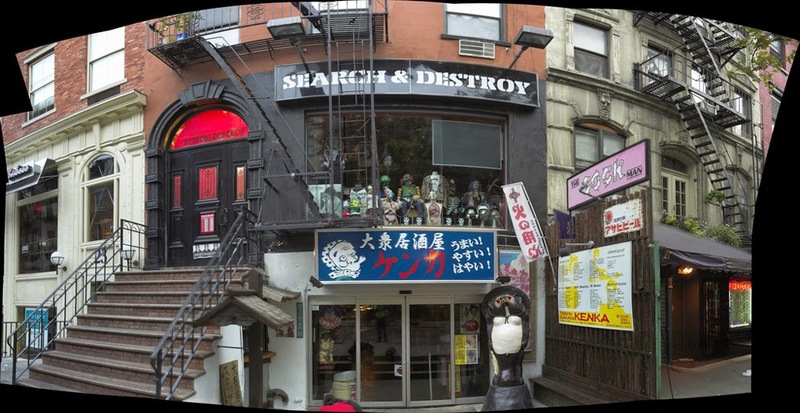 From its first appearance on the 1811 street grid to the swinging sixties to today, the article highlights some St. Mark’s Place’s famous and not-so-famous residents as well as looking at how the concept of an “East Village” first came about. If you are in NYC or environs and near a radio at 5:00 p.m. (driving back from your holiday weekend? ), James will be appearing on “The Ride Home with Pat Kiernan and Rita Cosby” on 77 WABC Radio. If you live in the five boroughs and have Time Warner Cable, then you’re probably familiar with Pat as the NY1 news anchor who reads you highlights from the newspapers every morning. 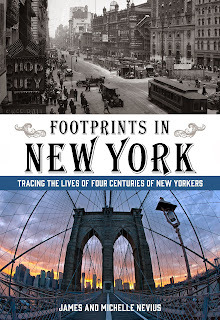 His afternoon radio show covers a variety of New York City topics and I’ll be talking with him and Rita about historical sites you can visit in New York that are part of our narrative in Footprints in New York (see below). The show is also streamed live around the world at WABC via http://player.listenlive.co/25211 or if you have iHeartRadio app on your phone or tablet, WABC is also available (search for “77 WABC”). If you can’t tune in at 5pm on Monday, there will be a podcast available sometime later in the week. We’ll post it to our Facebook page and Twitter account—so there’s no time like the present to follow us on social media. 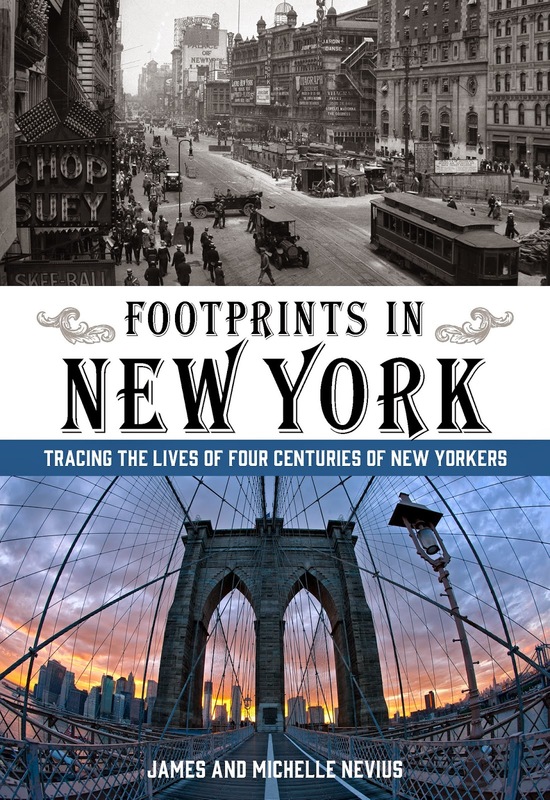 If you’ve read Footprints, you know that we explore a number of sites that are off-the-beaten track in all five boroughs. We’ve recently added a “Resources” page to our website (http://www.footprintsinnewyork.com/resources.html) to help you visit some of these spots—from the Wyckoff House Museum in Brooklyn to Poe Cottage in the Bronx. The Resources Page is a work in progress, so if there’s something you’d like to see added, please let us know!